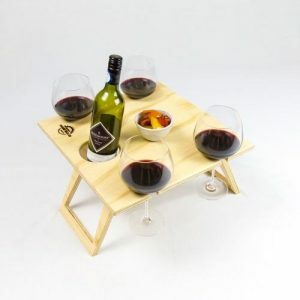 Unique wine & picnic table that folds flat & holds your wine bottle and glasses. Perfect for your day at the beach, romantic picnic, camping trip, or set them up at an outdoor concert to keep you favourite drop safe. Perfect for your day at the beach, romantic picnic, camping trip, or pop them on your table at home. 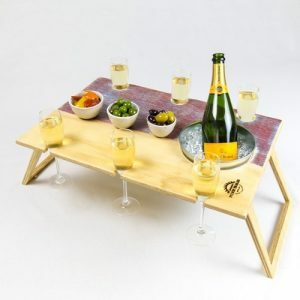 Unique wine & picnic table that is portable & holds your bottles cold, your food off the group and glasses safe. Perfect for any day at the beach, a romantic picnic, camping trips, or set them up at an outdoor concert to keep you favourite drop safe. PLEASE NOT CURRENT STOCK HAS WHITE ICE BUCKETS INCLUDED. 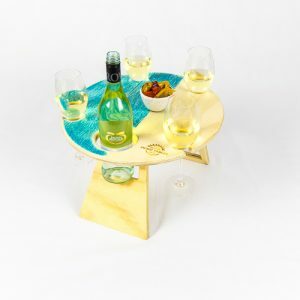 Summer Picnic Tables are a unique wine & picnic table range that folds flat when storing & holds your wine bottle and glasses safe when set up. Perfect for your day at the beach, romantic picnic for two. Sharing with a group of friends. During camping trip, or at any outdoor concert where you need to hold your favourite drop. All the while keeping your food off the ground. 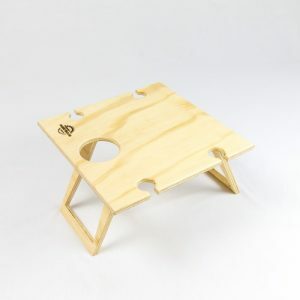 No more do you need to worry about your glass of wine or bottle of beer falling over on uneven ground. No more worrying about someone kicking it over, or the children’s ball spilling your favourite drink. With the standard size you will keep a standard bottle safe and glasses upright and snacks out of the dirt. Whereas the banquet version looks after six glasses and also features a bucket to keep drinks chilled. 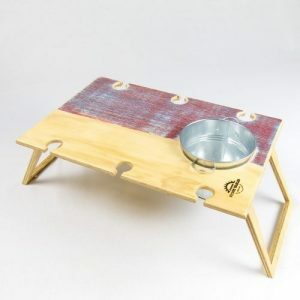 Available in three colours, two sizes these hand made tables are not only essential for any picnic. 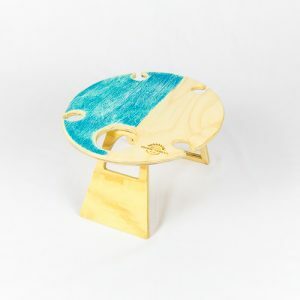 But also to add to your camping or glamping equipment list as the as an ideal accessory.